A slow cooker macaroni and cheese recipe that turns out perfect every time! Mama called me the week before Thanksgiving and said she wanted us to try a slow cooker mac & cheese recipe on Thanksgiving to free up some real estate in the oven. I wasn’t overly thrilled at the thought because the one and only time I’d ever tried a recipe for it, it was a total flop. And you can’t go screwing around with something as important as macaroni and cheese on Thanksgiving! But I tend to do what my mama says. So I had to figure this thing out. 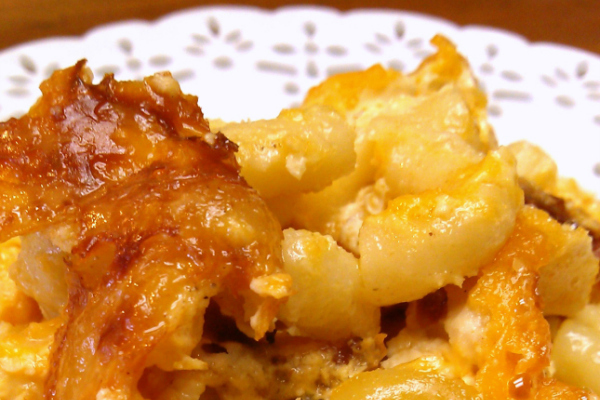 Southern-style baked macaroni and cheese uses eggs and sets up a little like a quiche. The edges get all golden brown and crusty and the center stays soft and melty. I figured as long as I used parboiled noodles and added more liquid, all I’d need to do was use my usual seasonings and things should work! But it was Thanksgiving! I was still having some major reservations about trying something new on The Big Day but went with it anyway. And it was a total hit! It cooked up almost exactly like my traditional mac and cheese and tasted perfect! I’ll be using this recipe a lot going forward! Especially in the summer when I don’t want to turn the oven on! Plus this will travel perfectly so it’ll be great for pot-lucks and tailgating. Woo-hoo! I’m so glad Mama made me suggested that I try it! 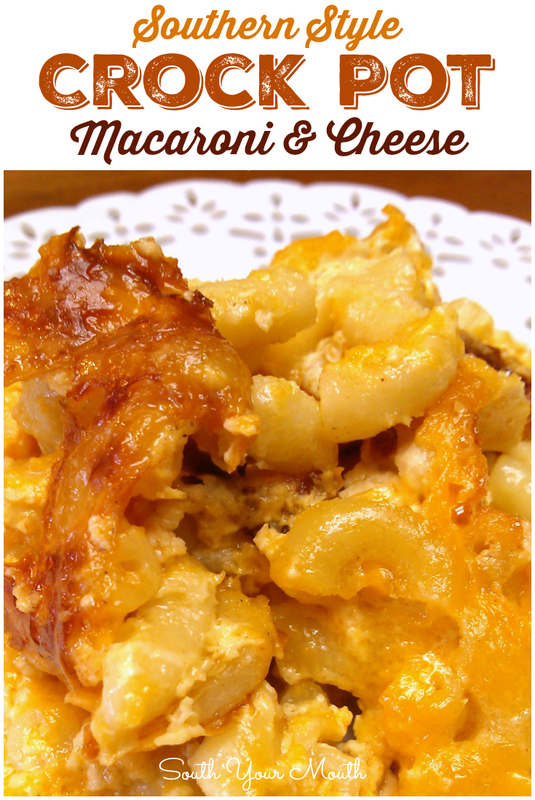 Also check out my traditional, BAKED recipe for Southern-Style Macaroni & Cheese! Boil noodles in liberally salted water for 5 minutes then drain well. Do not cook noodles longer than 5 minutes. While noodles are cooking, combine evaporated milk, milk, sour cream, eggs, salt, mustard, white pepper and cayenne pepper in a large bowl and mix well. Add parboiled noodles, melted butter and 3/4 of the shredded cheese to the milk mixture and stir until thoroughly combined. Spray the inside of a medium-large crock pot (approximately 4-qt size) with cooking spray then pour macaroni mixture into crock pot. Top with remaining cheese. Cover and cook on low for 3 hours or until set in the center and golden brown around the edges. *Mama bought extra sharp cheddar which I don’t know that I’d necessarily recommend for this. The sharper the cheddar, the less creamy it is. I have a feeling when I make this again with regular or mild cheddar things will be much creamier! Pinning! I haven't had a lick of luck with slow cooker mac and cheese but this looks so yummy. You're Mama is a smart cookie. Can't wait to try this. I didn't know that sharper cheese would be less creamy. I'll have to remember this. too small or too large? I have two but couldn't tell you the sizes. I'd use a gallon of water to help me figure out the sizes. If it fits a gallon of water it's 4 quarts, a half a gallon is 2 qts., etc. I hope that helps! real southern mac & chs is not creamy, it almost looks curdled but is soooooo good. Just finished eating this mac and cheese. I followed the recipe exactly. I'm sorry, but although it tastes very good, the recipe curdled. I used sargento cheddar (a variety of cheddars). I'm going to stick to making a bechamel sauce in the future. I'm glad it tastes good though! Maybe it was the combo of the cheddar and the temperature of the slow cooker. Cooked on low though. its supposed to be curdled! Did you have to cook the tripled recipe any longer than the stated time? Yes, it's supposed to curdle...I thought the pictures and description of it setting like a quiche made that pretty clear. The curdle's the best part! 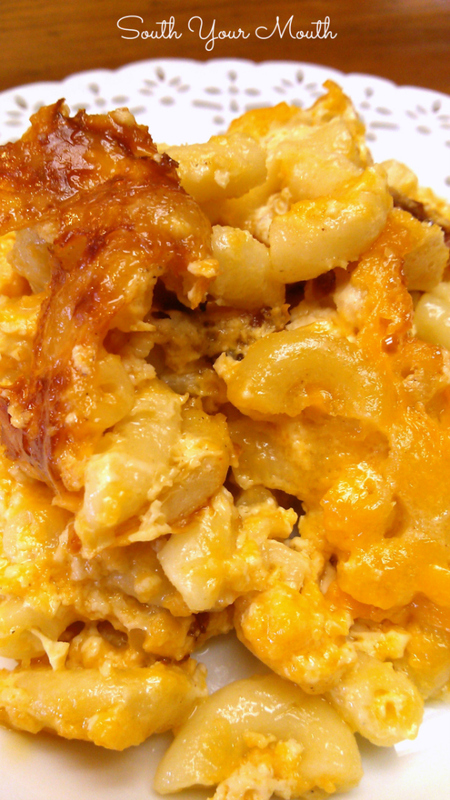 I was looking for a good southern-style mac & cheese to try this Christmas and I think I'll go with this one. This looks so good! I have tried macaroni and cheese a thousand different ways, but my texture is almost always bit off - like it was ever so slightly gritty. The taste is always great, but the texture issue is driving me nuts. I read somewhere that if I cooled the white sauce prior to adding the cheese it would not be gritty. Have you ever had a problem with that, and if so, how did you fix it? I can't say I've ever had one turn out gritty... hmmmm. I'll have to think about that. 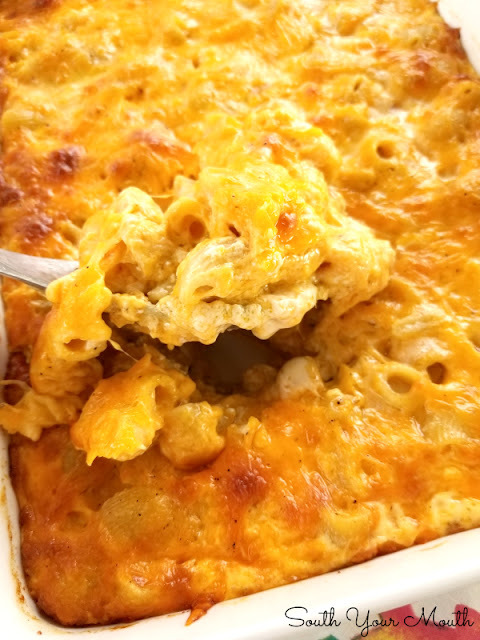 You can't cook the sauce of a Southern style (milk and eggs) macaroni and cheese because it will thicken too much to be stirred into the pasta. 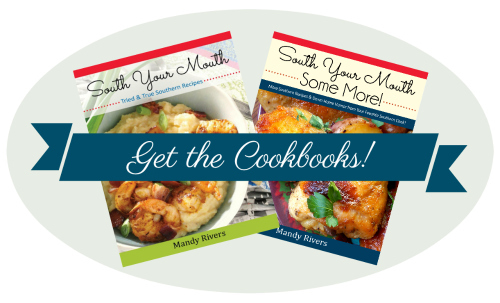 Are you cooking Southern style or a bechamel based? We made this as a side dish for a huge Christmas party this past weekend (90+ people). I tripled the recipe and it was gone in under 10 minutes. Did not change a thing (well...maybe added a little more cheese than it called for). WONDERFUL! I have sent several people to your site for the recipe! Thanks, this will be in heavy rotation at our house and future parties! Good to know! I am making this for our office party tomorrow. Thanks for the post Anonymous! I make my mac and cheese in the crock pot all the time . . . I use colby jack and a little bit of gruyere in my cheese blend. It's delish. If I am feeling really festive I add a little nutmeg! Try it! We are having a Mexican themed party and I was wondering if adding browned and drained chorizo would ruin the dish. Thanks, Mandy. I might give it a try. Can this be cooked in the oven in a 9X13 pan? If so, what temperature and how long do you recommend? I haven't tried it but I think it would work just fine. I'd cook uncovered at 350 for about 45 minutes. Good luck! Thanks so much! Can't wait to make it!! I have a crock pot mac and cheese recipe from Southern Living that I have used and used. It is so easy and sooo good. It uses sharp cheddar and Italian three-cheese blend, which makes it really creamy. My recipe does not have butter, and I'm a huge butter fan, so I may try adding that in, as well as the sour cream. Your recipe sounds divine. FYI...I followed your recommendation for cooking it in the oven. I cooked it @ 350 for 45-50 minutes and it turned out perfectly! Thank you! Mandy, this recipe is FABULOUS!!!! I have used it twice now and it's been a big hit both times!!! I love that it's so simple, easy, and delicious. I followed the recipe exactly the first time and the second I used sharp cheddar with a touch of Parmesan....superb! How many servings does this make??? trying to figure out if I should double for Easter dinner??? Thanks! the greased crock pot and pour enough melted butter over noodles to cover....half a stick is way too much and ends up setting on top when you take the lid off. 2 tbsp is enough. I forgot...4 hours is more like it. Borden has an 8oz pkg of shredded triple cheddar and then an 8 oz pkg of mild cheddar. OMG, so yum. This looks great. I was curious if I could pop it in the oven to develop a crust or that would be discouraged with this particular recipe. Love your blog, the captions on the kids drawings had me giggling! I'll start off saying that I'm a born and bred southern lady who married a born and bred Yankee from western New York (country, not city). Needless to say, he doesn't always get why we southerners make certain dishes the way we do. (He's still reeling over the last time he tried boiled peanuts.) But not too long ago, I was having company over and tried (for the first time) your green beans and potatoes recipe alongside this macaroni and cheese recipe as sides for the traditional country fried chicken. All I can say is that my (very picky) Yankee husband went back for seconds on both. And thirds for THIS macaroni and cheese dish! Congratulations - you have done the impossible! Can I cook this for an hour and a half on high in the crockpot? Sweet Baby Jesus!! This is the best Mac & Cheese I've ever had, definitely on the do-over list!!! Hi Mandy, I plan on using your recipe for thanksgiving, but was wondering if I can use block cheese and how much? I'm not sure I understand what you're asking me. I use a "block" of cheese too and shred it myself. Like the recipe reads, use 16 oz by weight which is about 4 cups. I hope that helps! I'm from Savannah, GA and was totally opposed to crock pot mac and cheese. Until, my husband had a church dinner party function, and was required to bring the mac and cheese. I broke down and found your post on Pinterest. Well, I am now a convert. This dish was a huge hit! Several people required me to forward the recipe. I followed the recipe almost exactly, aside from excluding the white pepper. I also used a blended cheese of colby and monteray jack cheeses. I also let my noodle sit until they were well cooled off. Amazing! Sorry I didn't respond sooner - I'm just seeing this! (??) I am so glad everyone enjoyed it!! Thank you for passing the recipe along too! I have made this and it is delicious. Plan to make this week and take to some friends whose house was flooded by Hurricane Harvey. Absolute comfort food. If I double the recipe, what should the time be adjusted to? I made this last night, and was really looking forward to it, but was disappointed! The flavor was good, but my noodles came out totally mush. I only parboiled them 2 min, not 5, and baked for 3 hrs on low. Not sure what the issue was. My husband suggested next time not to precook noodles and bake at less time. Any suggestions? Well... I don't know? I've never encountered mushy noodles with this before. And with you cooking them only 2 minutes, there REALLY shouldn't have been a problem. You were using standard macaroni noodles, correct? Not the little ones from a Kraft Mac & Cheese box or anything like that? The only think I could think is if the noodles were old. I bought some egg noodles at a 5/dime type discount store that cooked to mush half way through cooking them. And once I had a pot of chicken and rice turn to a mushy, gloppy mess when I'd used some super cheap, store brand rice. It was SO creamy and delicious! Thank you for the recipes. You're an awesome cook.... you've made me look real good at my house. I'm curious to know if you think this could be done in large quantity for 100 people and cooked in an electric roaster. Thanks! I think it would work! I made this for a cookout in the summer last year and it was a hit. going to try it again tomorrow. Thanks so much! It looks like this recipe has been going strong for at least 4 years so I'm convinced. I'm trying it for our Thanksgiving this year. We are having rack of lamb. I think this will be a wonderful addition!! This looks delicious thinking of going the easy route and doing this! Do you think I'd be able to double this in a 4qt crockpot? Would I have to increase cook time? Also, do you think there would be any issues with using rigatoni in place of elbows? I think so! I'd cook on high until things start to bubble then reduce to low (it will take longer to get all that going on low). Rigatoni will work great! Do you use jumbo elbow noodles in this recipe like you do your baked macaroni and cheese? I wrote this recipe using the standard (small) noodles since they would be easier to measure more accurately. WAS WONDERING WHAT WOULD HAPPEN IF I OMITTED THE EGGS?